Background: As a writer/scholar, Dr. Oliver Wang explores the intersections between race, ethnicity, media and popular culture. He is nationally respected as a leading expert on Asian Americans in popular culture, especially the Asian American involvement in hip-hop culture. In both his journalism and academic work, Dr. Wang discusses how communities on the margins of American power and privilege are using the tools of popular culture and mass media to empower their own voices and craft new identities. 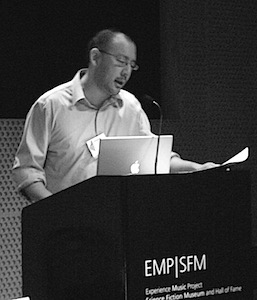 Dr. Wang writes regularly for National Public Radio’s All Things Considered, the Los Angeles Times, Wax Poetics Magazine as well as his renown audioblog, soul-sides.com. He is the editor and co-author of Classic Material: The Hip-Hop Album Guide and is currently completing work on Legions of Boom: Filipino American Mobile Disc Jockeys of the San Francisco Bay Area (Duke University Press). His essays on Asian American rappers in Alien Encounters: Popular Culture in Asian America (Duke) and AfroAsian Encounters: Culture, History and Politics (Univ. of California) represent some of the first publications dedicated to probing the history, meanings and legacies of Asian Americans in hip-hop culture. He has been involved in the national Rap Sessions tour since 2005, speaking on issues of race, representation, politics and culture. He has also given numerous public talks on his work and areas of interest, including at Duke University, the University of Michigan, the University of Florida, UNC-Chapel Hill, Oberlin College, Carleton College and Antioch College. Oliver Wang grew up in Boston and Los Angeles and earned his PhD in Ethnic Studies from UC Berkeley. He is currently an assistant professor of sociology at California State University, Long Beach. The last 10 years has seen a sea change in the number and diversity of Asian American representations within American popular culture. From the rebooted Hawaii 5-0 to the upcoming “Koreatown meets Jersey Shore,” Bruno Mars to Wong Fu Productions, Asian Americans have emerged after decades spent on the far margins of popular culture and are beginning to carve a space in the center. Dr. Wang traces the history of Asian Americans in popular culture and discusses how shifts in the media landscape – and amongst young Asian Americans themselves – are creating a potentially new era of representations. He also probes what the long term social, cultural and political ramifications of these shifts may portend for one of the fastest growing communities in America today. Drawing on over ten years of research, Dr. Wang discusses the history of Asian Americans in hip-hop music and culture, beginning in the late 1970s with Joe Bataan and his old school hit “Rap-O, Clap-O,” all the way to current ,with the success of Far East Movement’s “Like a G6.” In exploring this history, Dr. Wang touches on the changing strategies that Asian American rappers and DJs have pursued in representing themselves and their ethnic identity, especially as they struggle to gain visibility in a music industry that has historically treated Asian Americans as anomalies or gimmicks. Especially as hip-hop has become the most dominant form of musical expression amongst young Asian Americans, Dr. Wang discusses what this means for not only Asian Americans, but for interracial relations with other communities, especially African Americans. Hip-hop has be treated as a cultural “universal” but it remains an important terrain in which ethnic tensions are expressed and solidarities are forged.